You may not know it, but one of the biggest days in college football history is quickly approaching. No, not the spring signing period, although that was pretty exciting. No, not the inaugural College Football Playoff either, that’s practically a whole year away. Imagine something greater. Something more far-reaching. That’s next Friday. On April 25th, the Northwestern football team will vote on whether they will officially unionize. In order for the effort to pass, a majority of secret votes must come to a consensus. It’s tough to say what will happen, even though we’re only one week out. The University has pledged to fight every effort while opening a dialogue with players about their needs. Players have called for a drastic change in the economics of the NCAA. What’s the best solution? It’s anyone’s guess. But the purpose of this article isn’t to discuss the pros and cons of such an arrangement. That topic has been beaten into the ground already. It’s more of a ‘what if,’ full of countless speculation. So WHAT IF the measure passes? WHAT IF college football players can unionize? Will schools be able to meet the players’ demands? Will we see a strike in the future? Or will schools that can’t keep up simply drop out of Division I altogether? Now, this particular ruling would only applying to private schools so that’s something important to keep in mind. Programs like Alabama and Florida State wouldn’t be immediately affected. Now, imagine that the union is approved. Despite the players’ insistence that athletic programs make a ton of money (theoretically, they don’t- the quarterback can take it up with the rowing team), smaller universities are pushed out of big-time football by this ruling. For simplicity’s sake, let’s just say ALL private schools except for Notre Dame are gone. That’s huge. The Atlantic Coast Conference alone contains 7 private, or semi-private universities (Boston College, Duke, Miami, Notre Dame, Pittsburgh, Syracuse, Wake Forest). With private schools dropping major college football, realignment, everyone’s favorite hot topic, would be inevitable. Just out of curiosity’s sake, I decided to figure out what this might look like. Yes, there are some schools involved that are not considered to be top tier right now (New Mexico, Colorado State, etc. ), and there are others that are big time programs that are not included (Miami, Stanford, etc. ), but that’s just how it goes. For simplicity’s sake, let’s just assume that the break is clean- public schools are IN, private schools are OUT. This really isn’t wildly different from what we have now and it actually makes a whole lot of sense. 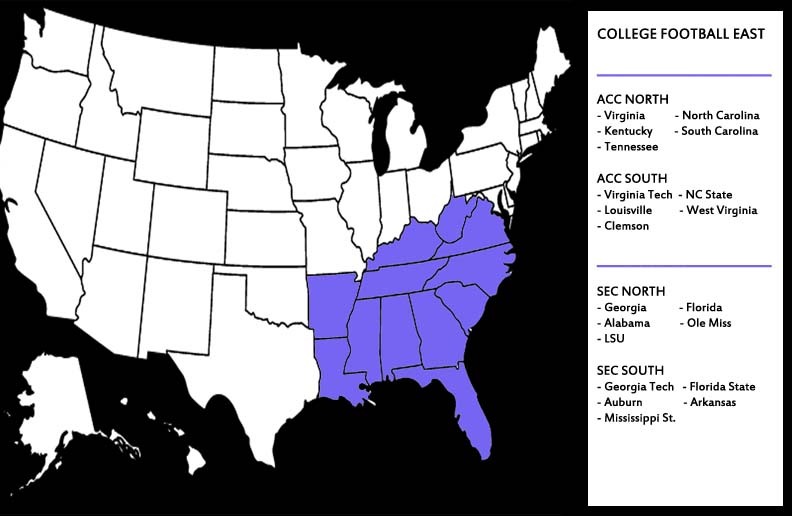 While, Kentucky, South Carolina and Tennessee have swapped their SEC affiliation for one with the ACC, and Georgia Tech and Florida State have taken their place in the SEC (West Virginia returns to the East Coast where they belong), divisions include close geographic partners and logical rivals. Each season would consist of a 9-game conference schedule, with each team playing within their division (either the ACC, or SEC). The winner of each division would face off with the winner of the other division within their conference (ex) ACC North vs. ACC South), then play the winner of the opposing conference (ex) ACC South vs. SEC North). 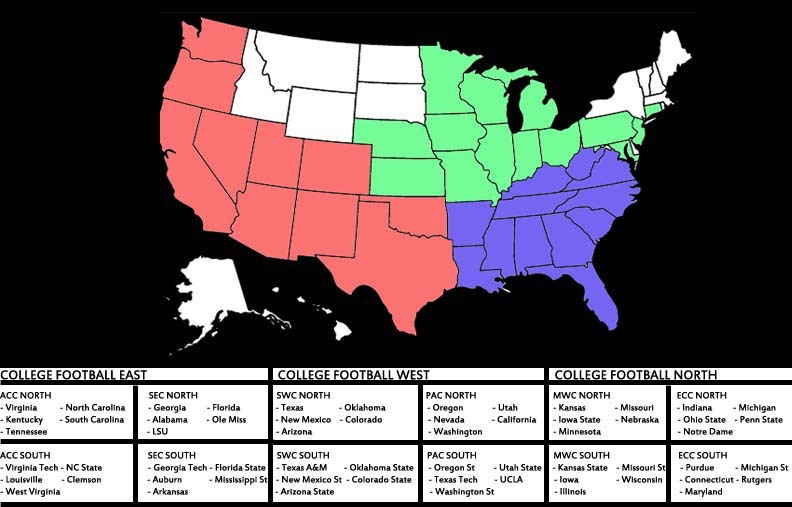 The winner of that game would ultimately be the winner of College Football East and join the winners of College Football West and North in the ‘Final Four.’ Since there are only three conferences, the final slot would be filled by an at-large team. As a resident of North Carolina, this set-up makes me excited. Do I miss the annual games against teams like Duke and Wake Forest? Of course not! There would still be 3 out of conference games to fill. The Blue Devils, Demon Deacons and East Carolina could fill up our schedule nicely each year. College Football East is geographically sensible, maintains natural rivalries and is entirely plausible under the ‘union’ scenario, or even a major SEC expansion to 20 (which would be similar if Florida State, Georgia Tech, Clemson, NC State, North Carolina and Virginia Tech joined). Sure, this is a little more of a stretch, but a lot of great teams out west ARE private schools so concessions had to be made. Stanford is gone. BYU is gone. Even Southern California is gone (which is hard to believe). Keeping that in mind, we again have compact divisions that make perfect sense. Close, geographic rivals, easy travel, exciting matchups. The only real outlier is Texas Tech which got the short end of the stick being the ‘third’ program out of Texas’ public school group. Some things can’t be helped. 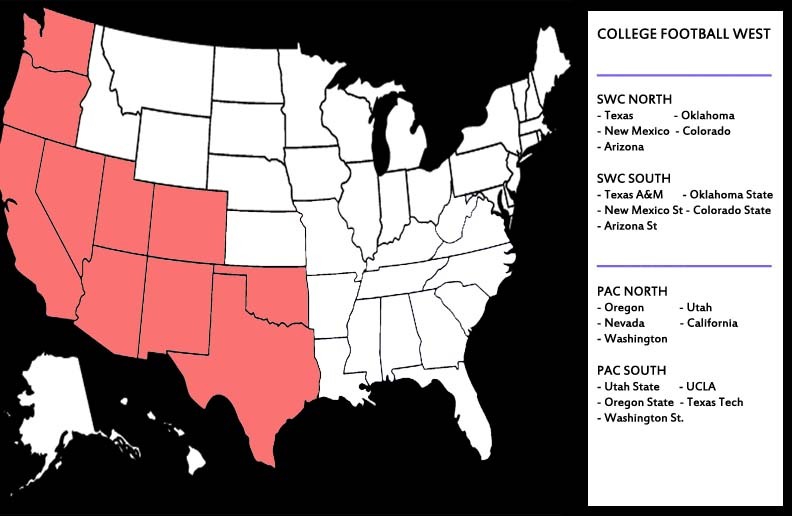 Regardless, College Football West is still a formidable group, featuring regular heavyweights and setting up exciting playoff matchups (imagine a SWC North- Texas vs. a PAC North- Oregon in the College Football West final? Priceless). Yes, that is Maryland up there with all those Big Ten schools. Why not? That’s where they apparently want to be. The set-up of College Football North preserves a lot of your traditional Midwestern rivalries. Ohio State-Michigan is still there. Kansas-Missouri is still there. Even Maryland-Rutgers. Oh wait, no one wants to see that. But like the other two conferences, it’s not quite perfect, but easily imagined in a new era of college football. If we’re moving towards an official NFL feeder league model, and that seems to be the case no matter how slowly it comes about, then these divisions would be high on the list. So there you have it. The hypothetical college football landscape of the future. It’s not perfect, but in a day when anything is imaginable, you have to think that it’s a strong possibility. The repercussions would be enormous and the change big, but that seems to be what the players are going for. What do you think? Do you agree with the divisions? Disagree? Are you concerned about where your favorite team would fit into this brave new world? Leave your thoughts in the replies. Wow, you put a TON of work into this! I think the private schools have risk, but the odds of it not somehow seeping into the public schools is slim. Or perhaps Congress will step in somehow to prevent the private colleges from being treated differently than public schools. As quid pro quo, NCAA reforms. It is hard to imagine a scenario where only Notre Dame survives as a private school. USC & ND are rivals that feed off each other and most likely look at what the other does and opt to follow that lead. I predict we will see both or neither in this setup. With that being said if you had to chose just one private school to survive it will most likely be USC. They have the UCLA rivalry to consider which provides a huge incentive for them to stay whereas Notre Dames rivals (besides USC) are schools that will drop down such as Stanford, BC, & Navy. Colorado, Arizona, & Arizona State would never join a midwest based division. These are schools whose recruiting & alumni demographics are California based. You should also reconsider Nevada, New Mexico State, and especially Missouri State. There are plenty of better options out there. I would switch Colorado State for Nevada, Wyoming/Utah State are each much better options than NMSU (personally I’d pick WY). For Missouri St. I would include Cincinnati instead. It’s an interesting perspective, however I’m not certain that unionization would be a bad thing for the private/semi-private universities. From a recruiting perspective alone, these schools would suddenly have a major advantage over some of the state-funded public schools – even those with seemingly unlimited amounts of money. Of course, what good does it do the student if the school has millions of dollars and the athlete gets very little. Within a few years, you could have a dramatic power shift where Unionized schools could suddenly start to take their pick of 5-star athletes. And why not? Alabama may give you the best chance at playing in the pros, but the NFL requires players to spend at least 4 years in the pros before you get any long-term benefits. By contrast, a unionized school could offer benefits from year one. if you had the chance to go to a school that through collective bargaining could offer health insurance (perhaps for the rest of your life) for the student and their family, compensation/pay-to-play, guaranteed scholarships (not ones that are “re-evaluated” each year or that could be pulled if you get injured), among other potential benefits, while still being able to compete for a playoff spot/championship, and getting a degree from a private university…then why wouldn’t you? You may even start to see a lot of athletes lining-up to transfer from the football factories to union schools where they have more rights and more power. As a Syracuse fan, I hope the student athletes get a chance to form a union and be treated like employees. The advantages, particularly with recruiting, could be monumental. Remember, the benefits of unionization are a blessing and a curse. If students are employee’s then their “scholarship” is taxable. SU being able to pay their players 10k won’t be as big of an advantage if it also means those players have to pay taxes on tuition. Not necessarily. I will have to defer to the experts on this, but according to a quick search of the tax code, an educational organization can exclude the value of a qualified tuition reduction it provides to an employee, from the employee’s wages.Therefore, the student athlete would not have to pay taxes on the taxes. Additionally, the employee can claim the first $5,250 in education assistance from an employer as tax free, and can claim more if it qualifies as a working condition fringe benefit. Even if a student-athlete did have to pay taxes on the full amount of the scholarship, that could be a reasonable cost that the students are willing to assume if it means things such as: health care, guaranteed scholarships, and greater control of the conditions the players are subjected. This is one thing that tax experts have differing opinions on. So while your argument is legitimate, their are several experts that both agree and disagree with that notion. The fine line is that the tax code you are citing involves tuition benefits for academic reasons. With college football and the NU ruling we are seeing a scholarship being used as compensation for services provided not related to academics. That is a key difference between the two and something of which we have never seen before. If the scholarship did in fact become tax-exempt it would expose a pretty big loop hole in the tax code open to exploitation. For example we could see a scenario such as a company paying for the education of their employee’s children. Someone in the government will see this train wreck coming and will put a stop to it. If tax-exemption ultimately wins out in the courts, legislative action will shut it down anyways. Uncle Sam has too much to lose if it happens. I don’t think it’s quite as murky as you make it out to be. This section of the code is specific to Educational organizations, such as colleges and universities. An employee of a university can get tuition tax-free for their spouse or children. Your scenario does not apply because a company would have to be an educational organization in order to grant tax-free tuition. Which is unnecessary since scholarships are tax exempt…so just create a scholarship program for your employees and make sure that your family wins. Lastly, even if the tuition was taxable, the first $5,250 is tax exempt as are fringe benefits. Pell grants and scholarships are also tax exempt, so you can cobble together the cost of tuition and room/board without requiring the student to pay any taxes on this as income. Lets say UPS pays an employee 100k a year total, and all of it is taxable. What this sort of loophole would do is allow UPS to save themselves some money by paying the employee less than 100k, but because they are paying it in the form of a scholarship fund and it becomes tax exempt, the aid employee is still getting paid the same on a technical level. While this example might not play out perfectly the fact of the matter is that if you set this in motion someone will figure out how to abuse it. At SP I did some extensive research on this subject which included interviewing lawyers personally. At this point in time you can’t guarantee that by going forward with a CFB union that scholarships will retain their tax exempt status. This is a type of discussion that can grow quite extensive and not the type for comments. You have my email and if you want more clarification feel free to ask me there. Your example makes no sense whatsoever. Employers offer tuition assistance to employees every day. It’s not illegal, and its not taxable income up to $5,250. If an Employer wants to pay their employee less than they are currently making but compensate by offering their spouse/child a scholarship I’m sure they can work something out. I’m certain that this kind of creative accounting happens all of the time. But, that’s not what we’re talking about here. It bears repeating: Educational organizations can exclude the value of tuition reduction from their taxable income. FYI- pitt as a state- affiliated university is more public than private at this point. Penn state is also in the state- affiliated classification. Likely both would be considered public for the purposes of athletic unionization. What would to all the tv money should this split occur? What about the confence networks? I’m guessing that you have PITT excluded because it is semi-private or “state affiliated”. But you included Penn State which is the same type of “state affiliated” university.